Under the Care Act 2014, only Safeguarding Adult Boards (SAB) can carry out a SAR. The SAR aims to learn lessons from an incident that will prevent deaths and serious abuse or neglect happening in the future. SARs are also used to explore examples of best practice in the way the case was managed, for example how agencies worked together to prevent and reduce abuse and neglect. What is serious abuse or neglect? the adult has suffered permanent harm, has reduced capacity or quality of life as a result of the abuse or neglect. 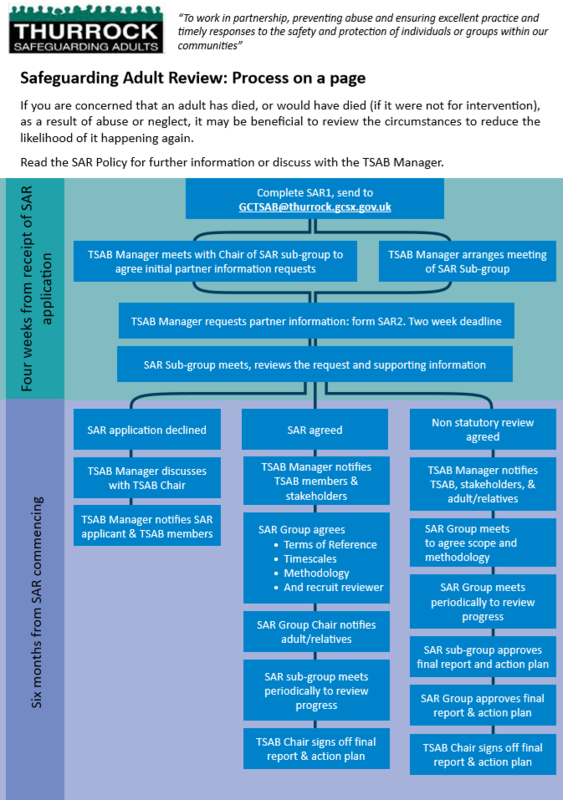 For more information on SARs, read the Thurrock Safeguarding Adults Board SAR policy or contact the TSAB Manager on TSAB@thurrock.gov.uk or call 01375 659713. The diagram below shows what happens when someone requests a SAR. Within four weeks, the request will be examined and a decision will be made on whether a SAR is needed. Whatever the outcome of the decision, the Board will keep everyone involved up-to-date with the latest developments. there is concern that an emerging theme may lead to serious harm or death of an adult in Thurrock if not tackled, such as under reporting of particular types of abuse or lack of advocacy.